The one thing, it can safely be assumed, that David Ortiz did not want to do on the night he returned to the Red Sox lineup after nearly eight weeks away was to speak for, or about, Manny Ramírez, on a night Ramirez's withdrawal from the lineup trumped anything that happened on the field in last night's 1-0 loss to the Yankees. So, after the game, Ortiz left without a word from a clubhouse - and a front office - roiled by Ramírez's decision to cite a sore right knee as a reason not to play, just as he had done for the last game in Seattle Wednesday. One player privately called it a disgrace and said he would not be surprised if the team tried to trade Ramírez. The team captain, Jason Varitek, begged off from answering questions. Ramírez, of course, was nowhere to be seen. He'd been sent to Massachusetts General Hospital during the game to have an MRI of both knees, the Sox evidently taking no chances that their slugger might have gotten confused about which one hurt. The tests, according to manager Terry Francona, came back clean. Was Francona disappointed that Ramírez had not made the effort to play on a night the Yankees drew to within two games of the second-place Sox in the American League East? "I think I've answered enough tonight," said Francona, who already had discussed in detail the sequence of events that had Ramírez first in, then out, of the lineup. "It's five minutes after the game. I'd like to talk to the medical people a little more extensively. There's time to answer questions about anybody. For me right now, it wouldn't be . . . "
Whether Ramírez would have made a difference against the 100 mile-per-hour BBs and darting sliders of Joba Chamberlain, we'll never know. But given the Sox had just three hits, all singles, against Chamberlain in his seven innings, it couldn't have hurt. While the Sox stewed - Mike Lowell was ejected after being called out on strikes in the ninth and Kevin Youkilis ducked another head-high fastball from Chamberlain - the Yankees not only held on for their seventh win in a row, they pulled off a deal with Pittsburgh for a lefthanded reliever, Damaso Marte, who will bolster their pen and an outfielder, Xavier Nady, who will help compensate for the absence of Hideki Matsui (knee) and Jorge Posada (shoulder). That much-awaited restoration of the Sox batting order to its previous state of grace? It never made it past the lineup card Francona discarded long before the anthem, one that had Dustin Pedroia and Kevin Youkilis at the top and Ramírez hitting cleanup behind Ortiz, with the rookie, Jacoby Ellsbury, dropped to the No. 9 hole. But it was left to Francona, who huddled with agitated Sox owners and general manager Theo Epstein before the game after Ramírez - through bench coach Brad Mills - said he was a no-go, to discuss the latest trading-deadline controversy involving their slugger-in-the-last-year-of-his-contract. Was Ramírez's contract situation - the Sox say they will not decide until after the season whether to exercise the options they hold for 2009 and 2010 - a topic of discussion during the huddle? "I'm not going to tell you what we talked about at the meeting," Francona said. One of Boston's three hits was a bad-hop single by Ortiz against an overshifted Yankee defense. A similar shift by the Sox against New York strongman Jason Giambi led to the game's only run, Giambi topping a ball to the vacated shortstop hole to score Bobby Abreu, who had singled and taken third on a hit by Alex Rodriguez. Sox starter Josh Beckett had base runners with which to cope in all seven of his innings - leadoff man Johnny Damon set the tone by rifling one Beckett fastball after another foul before finally grounding out in a 10-pitch at-bat. But all of the Yankees' nine hits also were singles, and with Beckett limiting the Bombers to 1 for 8 with runners in scoring position, only one run separated the teams before the game was handed over to the bullpens. "That pitch to Giambi wasn't exactly where I wanted it," Beckett said, "but it was actually sufficient enough to get a weak ball, it just happened to be in a position where nobody was playing." The night contained the obligatory why-is-Joba-throwing-at-me moment for Youkilis, leading to a tense moment in which Beckett was poised to be the first Sox player to charge out of the dugout. "I thought he should have been [ejected]," said Sox reliever Manny Delcarmen. "It's gotten ridiculous right now." Chamberlain threw a head-high fastball that Youkilis ducked, the ball clipping his bat, in the seventh inning. Last year, Chamberlain threw two pitches over Youkilis's head and eventually was suspended two games. Earlier this month, Chamberlain threw a pitch behind Youkilis's legs after he earlier had slid hard into Chamberlain's legs on a play at the plate. Youkilis held his tongue after that game, saying if he unburdened himself of what he was thinking, it would only bring MLB down on his head. Last night, as Youkilis stared out at the mound, plate umpire Marty Foster warned both dugouts. There would be no retaliation from Beckett; when the Yankees came to bat in the eighth, he was out of the game, replaced by soft-tossing lefty Javier Lopez, who retired Abreu on a tapper to first. Potential fireworks loomed when Francona went to Delcarmen to face Rodriguez, but Delcarmen stuck to business, retiring A-Rod on a called third strike before being escorted off the mound by trainer Paul Lessard with what was described as a muscle cramp in his right forearm. Delcarmen said he has had some stiffness but should be OK.
With Chamberlain, who matched his career high in strikeouts with nine, out of the game, the Sox mounted their best scoring opportunity against reliever Kyle Farnsworth. 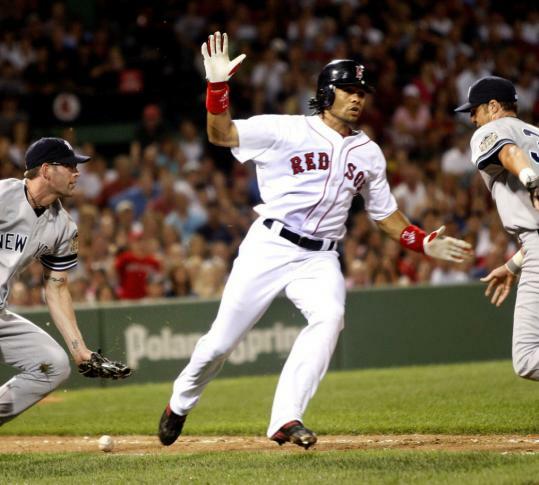 Rookie Jed Lowrie lined a single to right to open the eighth, and after Varitek fouled out to Derek Jeter, Coco Crisp beat out a swinging bunt down the first-base line. But Yankees manager Joe Girardi opted for Mariano Rivera. The Yankees closer overpowered Ellsbury, who looked at a terrific cutter on the outside corner for a called third strike. In the original lineup envisioned by Francona, Ellsbury was to have batted ninth, with Pedroia and Youkilis occupying the top two spots. But with Ramírez unavailable, Ellsbury hit leadoff and had a miserable night, grounding out twice and he was called out on strikes twice. Pedroia, who singled and stole second in the first as Ortiz struck out but advanced no farther when Chamberlain whiffed Youkilis, tapped out to Rivera, and the game went to the ninth. There would be no storybook return for Big Papi; leading off the ninth, he hit a soft fly to right for the first out. And what did the Yankees make of the missing Manny? "I've been watching him for 15, 16 years now," Jeter said, "so nothing he does surprises me anymore."